The latest installment of Alexander McCall Smith's perennially popular and irresistibly charming 44 Scotland Street series. When Pat accepts her narcissistic ex-boyfriend Bruce's invitation for coffee, she has no idea of the complications in her romantic and professional life that will follow. Meanwhile, Matthew, her boss at the art gallery, attracts the attention of the police after a misunderstanding at the local bookstore. Whether caused by small things such as a cup of coffee and a book, or major events such as Stuart's application for promotion and his wife Irene's decision to pursue a PhD in Aberdeen, change is coming to Scotland Street. But for three seven-year-old boy-Bertie Pollock, Ranald, and Big Lou's foster son, Finlay-it also means getting a glimpse of perfect happiness. 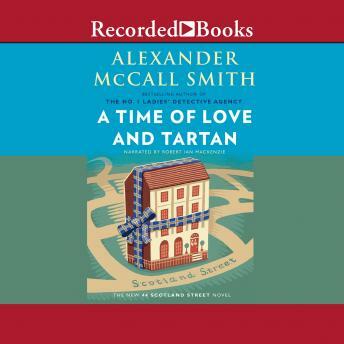 Alexander McCall Smith's delightfully witty, wise and sometimes surreal comedy spirals out in surprising ways in this new installment, but its heart remains where it has always been at the center of life in Edinburgh's New Town.